Getting started with payments. Setting up you the Payment Gateway and Proposal Defaults and Payment Terms. 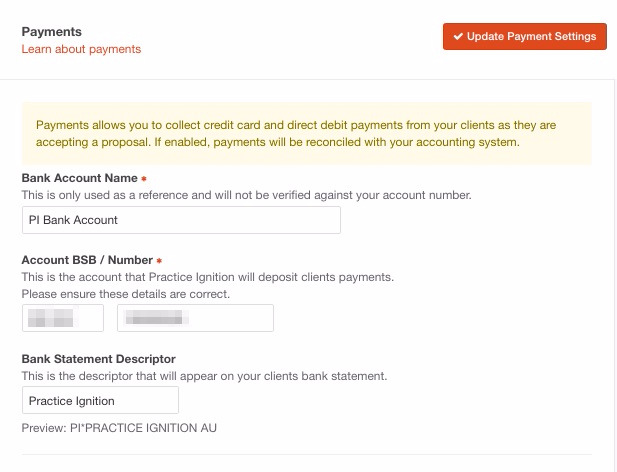 The payments feature in Practice Ignition allows you to collect Direct Debit and Credit Card payments from your clients. These payment are then automatically reconciled with you Xero or QuickBooks Online ledger. Note: To use payments, you must have an active subscription and a valid bank account. If you are currently on a trial, you need to upgrade your account. Payments and all payment method types are not supported in all regions. You can enable payments by going to Settings > Payment Gateway and clicking Enable Payments. To complete the process you will need to enter your bank account details and in certain regions some additional information which forms part of your Payment Gateway profile. Click the Complete Payment Gateway Setup button on the right to open the settings. Enter your bank details without spaces or hyphens, the spacing will automatically appear once you have typed in the numbers. Note: Once you have finished updating your Payment settings, remember to click the Update Account button on the top right hand corner. Next, select what payment types you want to offer your client by default when you create a new proposal. These defaults can be overridden at a proposal level. You have the option to make payments a 'Requirement' on all newly created proposals, which means that when you send a proposal to a client, they will have to enter their payment details before they can accept the proposal. This can also be switched off when creating/editing the proposal. Check out this article to learn more. 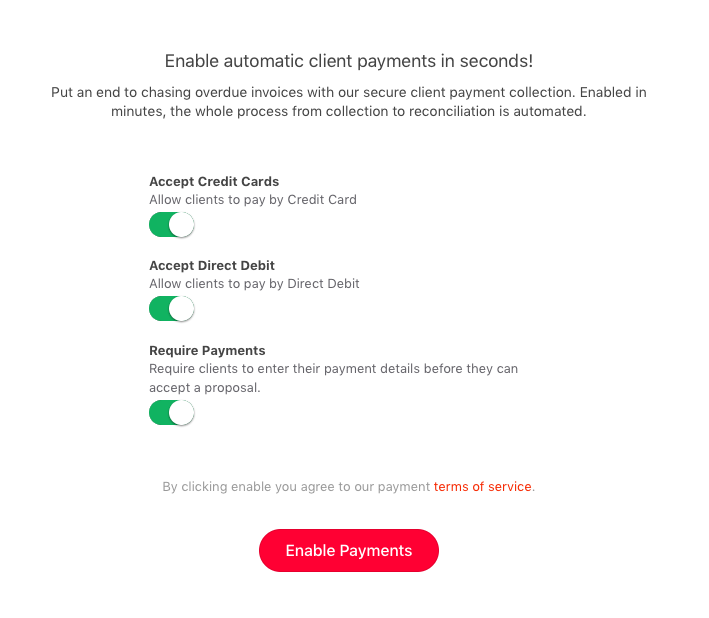 These settings control how many days the payment collection process should wait after the invoice has been raised. If you want to collect payment the same day the invoices is created then these can be set to Immediately. The Once-off Payment Terms apply to any invoices that are generated upfront on acceptance or are Billed on Completion. Recurring Payment Collection terms apply to any invoices that are created on a monthly recurring basis.